The Hour DC is a dream come true for gluten-free eaters. Organized by Emily Robins (Goldilocks Goodies) and Kate Sornik (Kate Bakes), The Hour DC is a fabulous happy hour that combines gluten-free food and drinks with fashion, art, and music. The event pops up at a new location each month, and March’s happy hour fit right in at Hemphill Fine Arts in Washington DC’s Logan Circle neighborhood. Hosted by Shira Kraft of Glutie Foodie, this was the gluten-free place to be! Alexandrine DeBianchi of DC Patisserie specializes in macarons and tempted us with two flavors of the delicate French confections. Both the chocolate caramel and the black currant were divine and had that perfect, melt-in-your-mouth macaron consistency. These were lovely, colorful, and naturally gluten-free to boot! Look for DC Patisserie’s seasonal flavors (cherry blossom!) at pop-ups around the district or on the patisserie’s website. 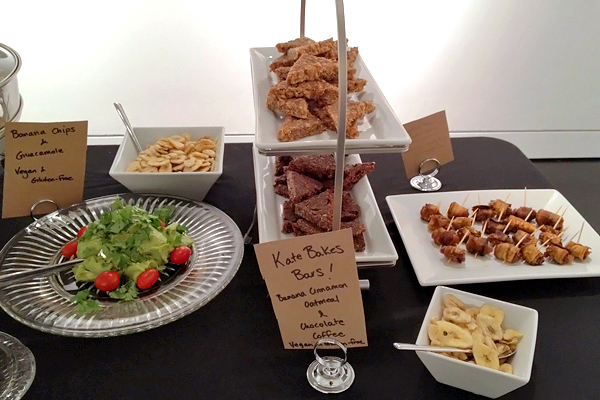 Kate Sornik of Kate Bakes filled us with her satisfyingly fancy snack bars. The chocolate coffee bar was surprisingly sophisticated, making it a happy hour hit, and I liked the banana cinnamon oatmeal bar so much I took a second one home with me! Made with seed- and nut butters, oats, and other tasty things, Kate bakes these in small batches on dedicated gluten-free equipment. 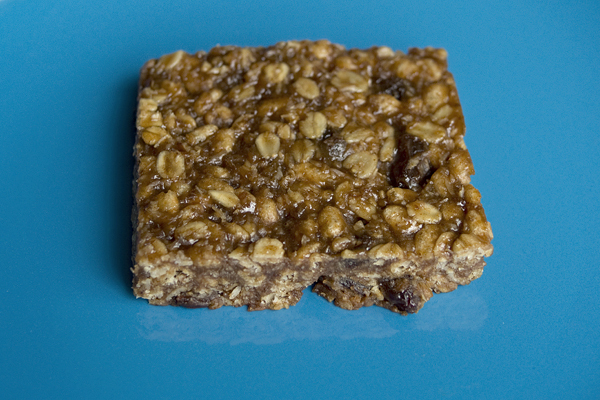 Find these amazing bars at future The Hour DC events or order through her website. True to Emily Robins’ motto, her Goldilocks Goodies sweets are just right. 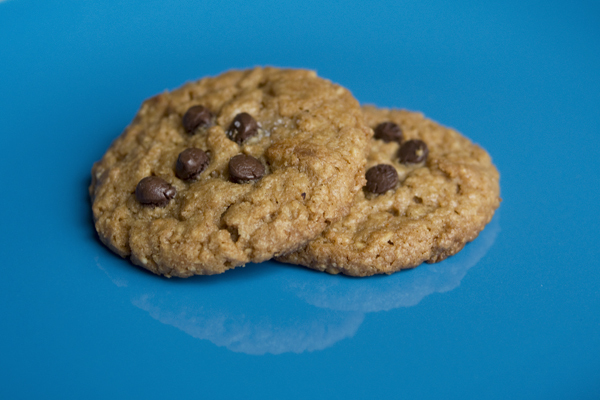 These peanut butter chocolate chip cookies have a nice chew, a subtly sweet molasses flavor, and are filled with real ingredients. Emily sources from as many local (Lancaster, PA) farmers and producers as possible, making for delicious little cookies that are free of gluten and many common allergens. 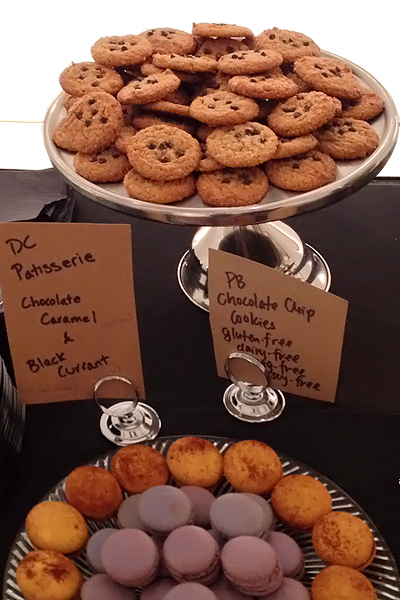 Pick some up at future The Hour DC happenings or on Goldilocks Goodies’ website. Baklava may remain one of the trickiest sweets to make gluten-free, but Katerina Georgallas has developed a scrumptious solution. Through Baklava Couture, she makes a sort of bite-sized baklava, with ground walnuts, honey, and a hint of orange and spice. The rich, sweet, and spicy baklava flavor is all there, with none of the gluten! 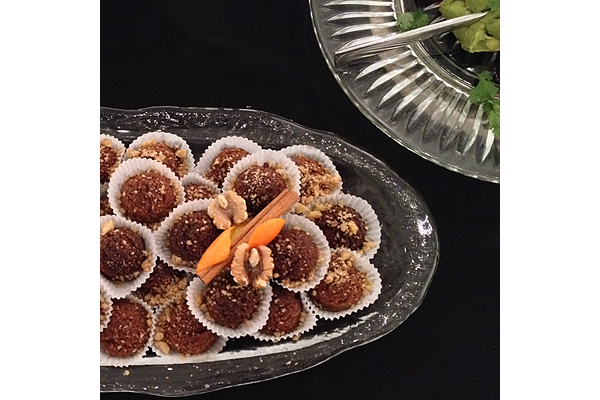 Taste these bites at pop-ups and events in the DC area, or order through Baklava Couture’s website. To quench our thirst, The Hour DC toasted us with gluten-free Angry Orchard hard cider and gluten-removed Omission beer. Cheers to an amazing event! Where? The Hour DC happens monthly. Get your tickets for the April event here, and you’ll get to spend the evening with DC’s burgeoning gluten-free community. Read Gluten Free Gimme Three’s roundup here! Disclaimer: All of the producers featured at The Hour DC bake with gluten-free ingredients and work to minimize or eliminate cross-contamination, often by using dedicated gluten-free equipment. However, not all may bake in dedicated gluten-free facilities. Please contact the producers directly if you have any concerns. Disclosure: The Hour DC provided me with a complimentary ticket to the March event. All opinions expressed are my own.